The University of Washington’s governing board is expected to approve a $165 million biology building Thursday, and students aren’t pleased that the funding is coming from tuition dollars. Prepare to say goodbye to the old University of Washington greenhouse. 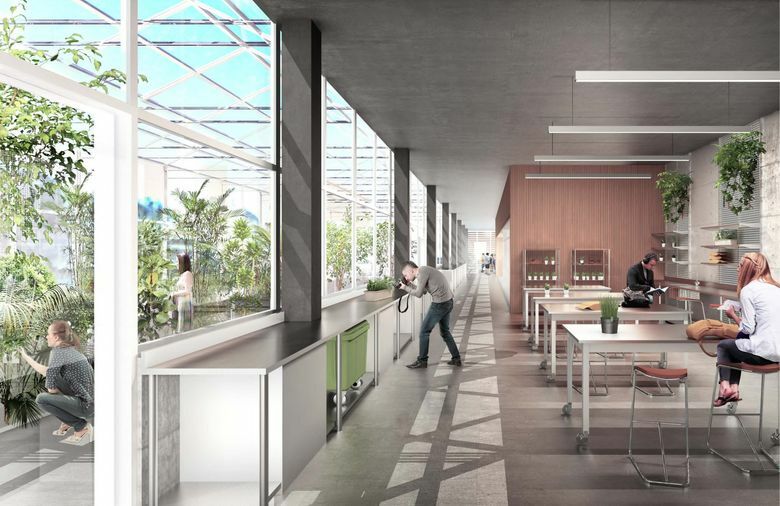 A five-story glass and steel building, to be built where the greenhouse stands now, will usher in a new way for undergrads to learn biology. Its design will encourage scientists — those most introverted of researchers — to mix and mingle, perhaps sharing ideas and inspiration. And the orchids, cactuses and epiphytes will get a new greenhouse home. 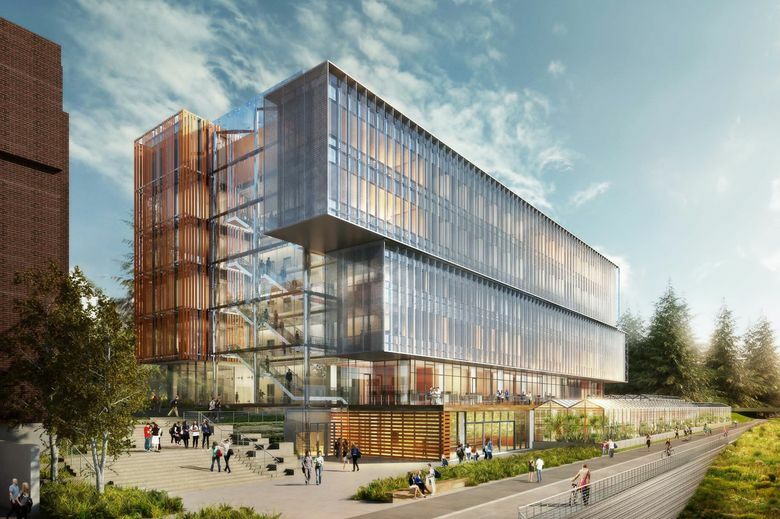 On Thursday, the UW Board of Regents is expected to approve the $165 million Life Sciences Building, scheduled to open in 2018. UW officials say it’s sorely needed. Students agree. But they’re unhappy that the university is using tuition dollars to pay for it. “We don’t want this to set a pattern,“ said Tyler Wu, president of the Associated Students of the University of Washington, the student government organization. The UW has tried to get the state Legislature to contribute, but has been rebuffed twice. Instead, funding is coming from an “unexpected infusion” of money from tuition dollars, College of Arts & Sciences Dean Robert Stacey said. The Legislature used to pick up most, or all, of the tab on new buildings for Washington college campuses. But increasingly it has stopped playing that role, or has asked the schools to chip in a significant amount. For example, the Legislature this year gave only $17 million toward the $110 million cost of a new UW computer-science building; the school is hoping for another infusion of state cash next year, and plans to raise the rest through private donations. Other buildings have been financed entirely with private donations, or federal research dollars. The Nanoengineering & Sciences building, also under construction, is being paid for with mitigation money from Sound Transit. The Life Sciences building marks the second time tuition dollars have been used at the UW to pay for a classroom building. A physics building, constructed in the 1990s, was the first. A few years ago, the UW administration changed its budgeting method, assigning money to its colleges based on the number of student credit-hours each one taught and the number of degrees produced. Arts & Sciences has the largest enrollment of any of the university’s 16 schools and colleges, and it began receiving $10 million extra each year. The department’s budget is about $190 million. Stacey said his department is run so efficiently that the $10 million amounted to a windfall of extra money, so he set it aside. When the Life Sciences project begins, the college will be able to use an accumulated $45 million as a kind of down payment, and bonds will be sold to finance the rest, much like a mortgage. The bonds will be paid off with future tuition dollars. In a resolution two years ago, the Student Senate endorsed the Life Sciences Building, but urged the administration to ask the Legislature for the money rather than use tuition dollars on capital projects. Students are concerned that administrators will increasingly want to use tuition to pay for buildings, Wu said. Student leaders, he added, have talked about crafting a test, or benchmark, for when it’s appropriate to use tuition dollars for capital construction. When the project first started to come together, Stacey said, he assembled an advisory board, including experts in local and national philanthropy, to find out if private funding could pay for the building. He learned that Seattle’s biggest philanthropists aren’t interested in paying for buildings anymore; they want to donate to programs, and to the hiring of top researchers — investments that can lead to science breakthroughs. 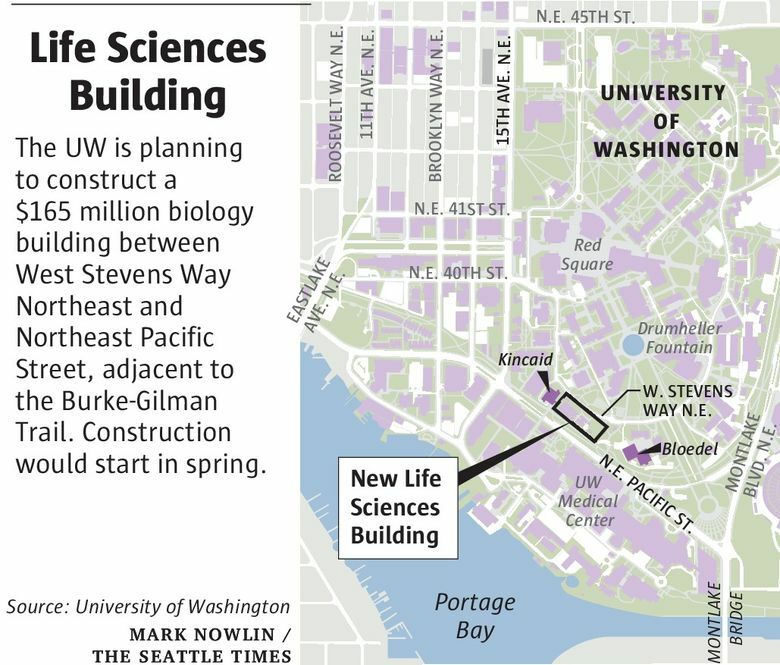 So while tuition will cover construction costs for the Life Sciences building, Stacey said the UW hopes to raise another $54 million from private donors to hire researchers, pay for equipment, and build out the basement and fifth floor of the building. No one argues about the need for the building, even a big one, that is designed to have nearly 200,000 square feet of labs, offices and classroom space, and a 20,000-square-foot greenhouse. The biology department is so short of space that the school has been unable to hire new faculty because it has no place to put them, even though the number of students majoring in the field has doubled in the last decade, said Toby Bradshaw, chair of the Biology Department. Undergraduates, he said, will be able to do real science, rather than repeating lab experiments with predictable outcomes — or “cookbook biology,” as it’s called. Scott Freeman, a principal biology lecturer at UW who’s gained a national reputation for an interactive style of teaching in big lecture halls, will be using a $1.5 million grant from the Howard Hughes Medical Institute to explore ways that students in introductory classes can do original lab research that fits into their coursework. The building’s wide-open spaces are also designed to foster an elusive, but much sought-after, exchange of information among colleagues. Scientists tend to be introverts, biology professor Jennifer Nemhauser said. This new building will have open spaces, a cafeteria and lots of conference rooms. That’s very different from the old biology buildings, Kincaid and Hitchcock halls, which resemble a rabbit warren of closed-off office spaces and labs. The building was designed by the Seattle firm Perkins+Will, and will be constructed by Skanska USA. The way the building is constructed also will allow passers-by on West Stevens Way to peek into the learning labs and see students at work on experiments. “Science will be on display,” Bradshaw said.